Alvarez - Chavez – is there any comparison? Alvarez – Chavez – is there any comparison? By John F. McKenna (McJack): Over the past few months there have been many comparisons made in the media between Saul “Canelo” Alvarez (37-0-1, 27 KO’s) and Julio Cesar Chavez Jr (43-0-1-1, 30 KO’s). It was assumed before last Saturday night’s destruction of Ryan Rhodes (45-5-1, 31 KO’s) by Alvarez that the two popular Mexican fighters were of similar ability and were on a collision course. The matchup it was hoped would be a promoters dream in a country where great fighters from the past and present are lionized by the media and fans alike. 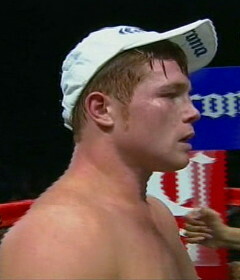 It is now clear that the soon to be 21 year old “Canelo” is going to far surpass Chavez in fistic ability. Chavez is a decent enough fighter who fights with a lot of heart and has made it through 44 fights without a loss. At 25 years old he is much closer to his prime than the rapidly advancing Alvarez. Even under the tutelage of Freddie Roach, Chavez is probably about 90% as good as he is going to get. Alvarez on the other hand is making huge advances from one fight to the next. Before his Saturday night fight with Alvarez, Ryan Rhodes told HBO broadcasters that he thought he was catching “Canelo” at the right time and that in another eighteen months it would be too late. Rhodes, however, did not come close to winning a round and was stopped 48 seconds into the 12th round. Rhodes was never able to get anything going against his youthful opponent. He was criticized by some for not letting his hands go, but usually his opponent deserves the bulk of the credit for making that happen. No matter what Rhodes tried Saul had the answer for it. Rhodes had thought that his experience would make the difference but it helped him little against Alvarez. Specifically, Alvarez deserves credit for a blistering body attack which took Rhodes out of the fight. He also showed faster hands than he had exhibited in previous fights. Fast hands make opponents fearful at attempting to counter. Saul also deserves credit for his defensive radar which left Rhodes frustrated as he missed his shots time and again by a fraction of an inch. He also deserves credit for being technically sound and not looping his punches, thereby limiting Rhodes opportunity. Rhodes was surprisingly candid when he was interviewed after the fight saying that he had underestimated Alvarez’s power and that “His body shots were fantastic all the way through the fight.” Rhodes also said that he was amazed at Alvarez’s poise as a fighter. Rhodes stated that this was not the end for him as a fighter and that he was beaten by a superstar. There is no question that Alvarez is going to continue to improve as a fighter and that he is more than ready for Julio Cesar Chavez Jr. He is already at a level above Chavez and his stature as a fighter will far surpass that of Chavez. « Does Haye have what it takes to defeat Klitschko? Boxing » Julio Cesar Chavez Jr. » Alvarez – Chavez – is there any comparison?